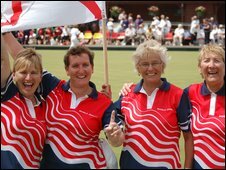 Jersey won the women's fours at the British Championships at Les Creux Bowls Club. Karina Bisson, Gean O'Neil, Chrissy Grimes and Carole Allen defeated their English rivals 16-13 in a tense 18-end final on Monday. Jersey's skipper Bisson told BBC Radio Jersey how pleased she was to win. "It's always very tense towards the end because you know it can all go wrong but we just holding onto faith that we could win at the end," she said. In Monday morning's other finals Scotland's Marie Todd defeated Edna Bessell of England 21-20 in the singles. And it was more bad news for the England team as they lost 24-12 to Wales in the triples. However the ladies pairing of Ellen Falkner and Sue Alexander restored some pride by winning the pairs 21 -12 over Scotland. The British Isles International Series continues at Les Creux until Thursday.